The campaign concept. In this case, wilderness delving in a Napoleonic milieu set in a North American continent divided between a number of quarrelsome nations – i.e. no United States, but independent nations like the Commonwealth of Massachusetts and the Texas Republic. The inspiration – well, I’ve always had an interest in this sort of thing. I think the first “wargame” I ever played was one of my own invention, where I took a map in a coloring book that showed the growth of the United States (i.e. Original colonies, Northwest Territories, Louisiana Purchase, Gadsen Purchase, etc), pretended they were all separate countries, and then devised some manner of them fighting battles and expanding their territory. This idea popped back into my head when I watched an episode of How the States Got Their Shapes. I knew that I wanted to do a blog post about the show (which originated from this blog, apparently), because I liked it, but I had other things to do so I put it on the back burner. In planning NOD 9, I realized I needed another article, and so I thought about exploring the idea of a USA with different borders and city names, and tried to find a way to make it relevant to role playing games. As for alternate history … well – pretty light on that in the article. It’s more of a “we need an excuse to explore the continent and fight battles, so here you go” than a study in what bizarre historical twists were necessary to bring the Altered States of America into existence. Marie Antoinette and other historical figures show up in the descriptions of the nations of North America, but the historical details are left up to the Referee. The campaign is ultimately about working towards the end game of building forts. To that end, it makes use of a Leadership score (level + charisma) that allows for a number of henchmen. This creates the likelihood of mass battles (or mass skirmishes). Of course, dungeons might be found in the Mysterious Interior and explored, but they aren’t the focus. The main focus is finding enough “treasure” to keep the exploration going and thus have a hand in drawing the map of North American. – A small list of Napoleonic-era weapons and cannon. – A small run down of Napoleonic men-at-arms – grenadiers, voltigeurs, lancers, etc. – The leadership score table. – Quick sketches of the nations of North America, with population number, capital, other cities, form of government and ruler. The countries use the original names of cities where possible to give the place an otherworldly feeling. The base start year of the campaign would be a very loose 1800. – Some ideas of what might be lurking in the Mysterious Interior. Including pilgrims setting out to found a New Zion in the wilderness, monsters, lost cities and tribes and, of course, Native Americans. The article does not contain a massive hex map of the Mysterious Interior, but I am working on such a map that I’ll post on the blog when it is finished. I might even try to run an ASA play-by-email campaign, though I’m not certain about how well that would work. Hopefully I’ve given folks a better idea of what the article entails. It’s not earth shattering, but might be useful for folks wishing to wrap their heads around a campaign of exploration in an alternate North America of 1800. If it seems that there’s enough interest, I might expand it into a beer & pretzels game like Space Princess. Future Campaign Sketchbooks should include a campaign of mutant caravans on the Polyester Road and JD Jarvis’ Mutant Front. 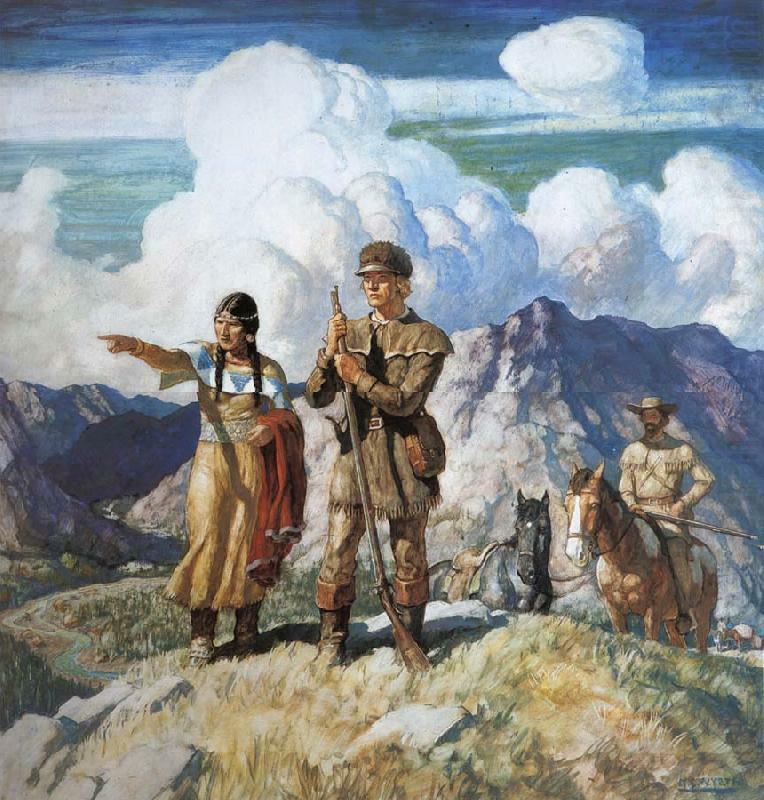 Image of Lewis & Clark Expedition by N.C. Wyeth. From HERE.